Sean Avery has skills. Not Napoleon Dynamite's coveted nunchaku skills, bow hunting skills, or computer hacking skills, but skills nonetheless. Deciphering just what those skills actually are, is a matter of debate. At his best, Avery scores timely goals, throws his body in harms way and rattles the opposition. Various media outlets have more than once tabbed him as an "Evil Genius". Sadly, all to often, he is at his worst. 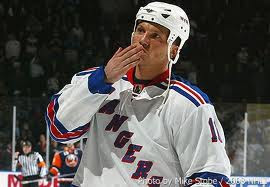 Succinctly, Sean Avery's worst consists of taking pointless penalties, making tasteless remarks to the media, unseemly cheap shots and aggravating/embarrassing his teammates. After an unmemorable thirty-six game stint with the Red Wings, he was traded away to Los Angeles. When asked, Detroit GM Ken Holland cited a reason for moving him. After the lockout, while with the Kings, Avery continued to endear himself to his peers. If his comments weren't embarrassing enough, Avery then became involved in a near-scandalous racial slur incident. During a scuffle involving, then Edmonton Oilers heavyweight, Georges Laraque, it was alleged that Avery had called Laraque "a monkey" after declining an invitation to fight. Avery has always denied it. Laraque has always maintained what he heard. Believe what you like, but Avery's then recent, insensitive, French-Canadian remarks damage his credibility in this courtroom. Add Sean Avery, who often selected Brown to ridicule. Brown has had a slight lisp since childhood... It was something that Brown said was unimportant, but Avery would mock his speech, among other things. The friction in the room resulted in fist fights, with other Kings players jumping in on Brown's side. On February 5, 2007, Avery was traded by the Kings to the New York Rangers. It is rumored that the Kings players held a party to celebrate his departure. The Rangers seemed to be a good fit for Avery. He played well for them immediately, and was re-signed by New York for another season. For the most part, the '07-'08 season went well for Avery and the Rangers. Then during a first round playoff game against the Devils, Avery turned in order to face and screen goaltender Martin Brodeur during a Rangers power play. Waving his hands and stick in front of Brodeur in an attempt to distract him and completely block his field of vision, Avery was doing his best to be himself. Brodeur protested, even Rangers teammate Chris Drury appeared to tell Avery to desist, but he did not. The puck was cleared, but on the next offensive attack, Avery, somewhat ironically scored the power play goal. Avery did get into the head of Brodeur in the series. In interviews with MSG, Avery called Brodeur a "big whiner" and referred to him as "Fatso" when discussing being snubbed by the goaltender in the handshake line. The NHL dubbed Avery's screen tactic unsportsmanlike, immediately clarifying the rule. Making it the "Avery Rule" in the process. The act caught national attention, and it was about then media members started throwing around the "evil genius" term. While immensely effective against New Jersey, Avery was nearly invisible in the next round against Pittsburgh. The only memorable incident from the series: Avery's ruptured spleen. For a time, it appeared to be his last game with the Rangers. A free agent, Avery signed a four-year, $15.5 million deal with the Dallas Stars. The puck had yet to drop on the '08 - '09 season when Avery began making new friends with an ESPN interview. Nobody cares about Jarome Iginla and guys like that. They're just not exciting enough. They don't bring enough to the game. An insult per sentence this guy... but, he best was yet to come! On December 2, 2008, after the Stars' morning skate before a game against Calgary, Avery approached a group of reporters in the dressing room and informed them that he was about to make a statement. He then proceeded to make the following comment directed towards Flames' defenseman Dion Phaneuf, who was dating Avery's ex-girlfriend/starlet Elisha Cuthbert. I'm just going to say one thing. I'm really happy to be back in Calgary; I love Canada. I just want to comment on how it's become like a common thing in the NHL for guys to fall in love with my sloppy seconds. I don't know what that's about, but enjoy the game tonight. Avery was suspended for his declaration. According to TSN's James Duthie, his Dallas teammates didn't want him back. Today, I spoke to three Stars players, who were blunt in their assessment of Avery. They agreed to be quoted as long as their names were not used. 'We hope it's the last time we ever see him,' says one veteran. 'Our locker room is the happiest it has been all year right now,' says another player. His coach at the time, Dave Tippett saw it the same way. Another team, another worn out welcome. Avery was placed on waivers. Eventually, the Rangers took him back. Aside from a Tim Thomas stick smack to the back of the head during a TV timeout, he played last season with a relatively low profile. However, Sean Avery made a comeback this weekend. In the midst of an 8-2 drubbing of the Edmonton Oilers, after a big Avery hit, he a Edmonton's Ladislav Smid began jawing at one another behind the play. Smid appeared ready to fight, but Avery delayed. Yapped some, delayed... and then seemingly launched himself at Smid as he began to turn away. The incident sparked a near brawl as Avery hit the ramp to the dressing room. All the players on the ice and a few on the benches tussled. It was a clean hit that Smid initially took offense to. So Avery's teammates have his back on this, right? How long does Avery have until these teammates sour on his antics? It's a long list of transgressions to be sure. Ken Holland may have the very same impression of Avery, even after nine NHL seasons away from the Red Wings, but Sean Avery has some skills. How else can you explain the impact that the 5' 10", 195 lb. Avery has had during his career? There is no debate. The man is infuriating. But, just whom does he infuriate more, his opponents or compatriots? Avery is such a punk! He did it again last night against the Bruins... Behind the net a stick goes up high and then you get his 10 second delayed reaction and his huge fall to the ice with his hands on his face. Replay showed he didn't even get hit. Why does he get these calls all the time is my question? If only he had to skate the same ice as the Knife!